Tripod Joint is used at the inboard end of car driveshafts, it enables power transmission even in case of angle shifting. 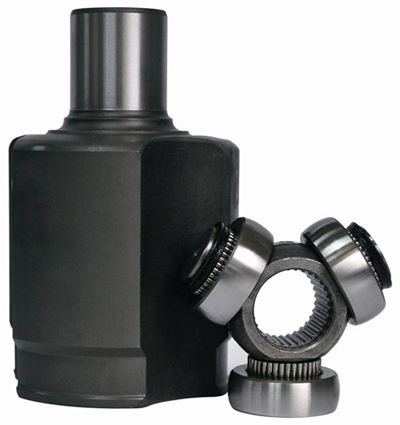 Tripod Joint has needle bearing / barrel-shaped rollers mounted on a three-legged spider / three-pointed yoke, instead of balls bearings. These fit into a cup with three matching grooves, attached to the differential. The rollers are mounted at 120-degrees to one another and slide back and forth in tracks in an outer “tulip” housing. This three-legged spider with tripod has only limited operating angles, but is able to plunge in and out with a longer distance as the suspension moves. A typical Tripod joint has up to 50 mm of plunge travel, and 26 degrees of angular articulation. Ｈow does Tripod Joint works? Tripod joint animation in solidworks. 4 Comments to "Tripod Joint"
I have a 91 toyota camry and im trying to figure out if i can replace the housing tripod or will i have to replace the entire transmission, i have the bell type. Can I get to which is more efficient in an off road vehicle. The cv joint or the tripod joints. Or any other drive shafts.